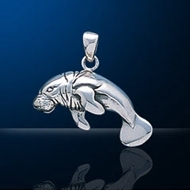 Presently, our marine life pendant collection consists of whale, whale tail, shell, crab, sea elephant, manatee, seal and corals. Marine creatures are mysterious and intriguing. 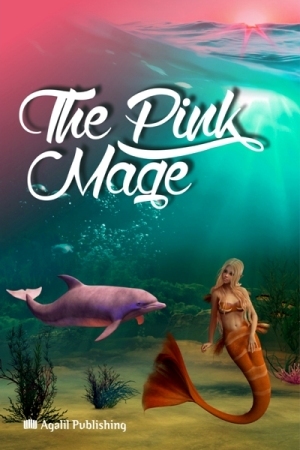 Naturally as they are from another world - the world of the deep. A world, we know is there when we peer into seas yet remains hidden until men in flippers take that leap of faith into its swallow. All hail the biggest animal in the world! 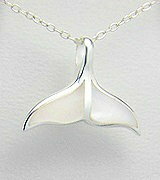 And this 925 sterling silver whale pendant is rather large. 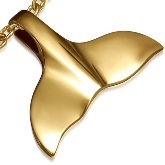 Measuring two inches wide, this is a large whale pendant, but more significantly, it is an artistic representation of a whale. Look no further if displaying your love of whales artistically is what you want to do. The curious motif on the whale tail is aboriginal art. Whale tails represent strength and speed. 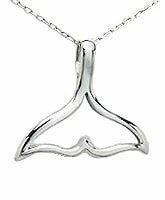 Whale tail pendants are also good luck charms. 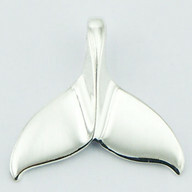 We have a wide selection of sterling silver whale tail pendants below. Please note the dimensions.  The photographs below are not a good indicator of size. Chains are not included. Mammals reside in oceans too. After the whale, we have a few others to show you. 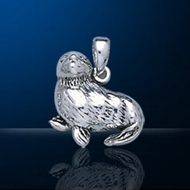 Here's another sterling silver marine mammal pendant in our collection. 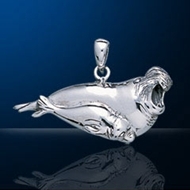 It is a sea lion pendant in an artistic design. One of the hind flippers form the bail. The curves of the sea lion's streamlined body is attractively and artistically highlighted. 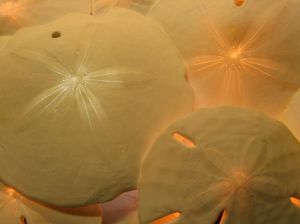 Sand dollars are marine animals that are related to star fishes, sea cucumbers and sea urchins. After Sand dollars die, their skeletons are washed up to the beach and turned bleached by the sun. The name 'Sand dollar' was given due to their shape, which is like a large coin. This unusual sterling silver Sand Dollar pendant is very realistic looking. Like the real ones, it slightly concaves upwards. Even the surface is textured and the shape crafted to an imperfect disc to look lifelike. This 925 sterling silver sand dollar pendant is similar to DP 260 with embedded gemstones for a richer effect. A conch shell 925 silver jewellery pendant with mother of pearl. 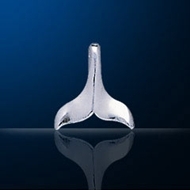 The choice of mother of pearl in this 925 silver jewelry pendant is brilliant. Much work goes into the crafting of this 925 sterling silver seashell pendant with ridges and a lot of contrast. It's convex body gives it a nice shape and contribute to making it looks like a real shell. Can you recognize this marine creature? 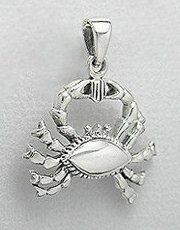 This 3-dimensional sterling silver lobster pendant comes with so many details. You can see both feelers, 14 separate, isolated legs and even the eyes. 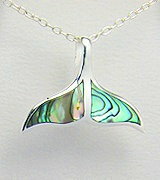 Paua shell pieces inlaid on both sides adds a very nice touch to this piece of marine life jewelry. Here's a nicely detailed crab and it is 3 dimensional too. This crab sure is prettied up - with gold plating and micro set CZs. 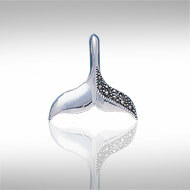 You have seen plenty of sterling silver whale tails above. Here's something different - it is in stainless steel and what a color! 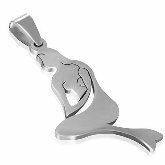 Outline of a mermaid sitting ashore. One side is glossy and the other matte. Both look good so you can choose to display either side. Vast territories of coral reefs are disappearing quickly. Corals die easily from environmental changes. If there are too much nutrients in the area, rapid algae growth can swamp coral reefs. When the salinity of water in the area drops, corals die. 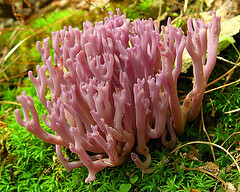 When temperature fluctuates by a degree or two, corals die... and the list goes on. 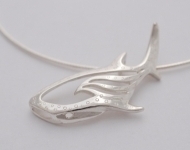 Wearing marine life jewelry helps to remind us the urgency to love and protect our environment. The bright hue of pink corals are etched onto this 925 silver jewelry pendant through pink enamel. With the companion of two very bright embedded cubic zirconia, this piece of coral 925 silver pendant jewellery is both bright in colour and sparkle. This pink coral 925 silver jewelry pendant comes with one embedded cubic zirconia. This yellow 925 sterling silver coral pendant comes with an embedded cubic zirconia too. 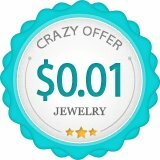 Great Deals on Sterling Silver Chains! 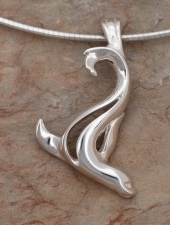 Are you looking for a matching sterling silver chain with a sea life pendant to get yourself a great looking sea life necklace? 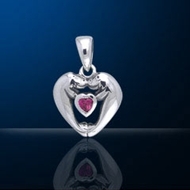 You'll get a great deal on our chains when purchased with a pendant on this website. Click 925 Sterling Silver Chains for details.